REVA MET (रेवा एमबीए एप्टीट्यूड टेस्ट) 2017: REVA University Management Aptitude Test is an entrance exam which conducted by REVA University. REVA University which is located in Bengaluru and it offers management courses to postgraduate students and provides the two-year degree program in master in Business of Administration (MBA). REVA MAT conducted every year by REVA University for postgraduate students. Interested candidates first have to apply by submitting the application form for REVA Management Aptitude Test 2017 in both online as well as offline mode from 01st March to 10th April 2017. After the successful application submission, candidates will have to appear in the ASP/REVA MAT 2017 on 21st April 2017, which is an entrance exam to get admission in MBA. REVA MET Admission is available for new session post graduate students. REVA University provides education in management sector and also provides degree certification. Other details like eligible criteria, selection process, exam pattern, syllabus and other complete details related to REVA University Entrance Exam for MBA are given below. Students should be passed in previous three or four year Bachelor degree with minimum 50% aggregate from University or Deemed University. Applicants of reserved category (SC/ ST) should be passed in bachelor degree with minimum 45% aggregate. Final year appearing students can also apply for admission. Good and high score card in REVA MAT or CAT/ MAT/ CMAT or any other related examination. Applicants need to open the official website of REVA University, i.e. reva.edu.in/. Candidates need to download the application form from the official website or the link given below. Duly fill the application form with complete authentic details. Attach the copies of all the necessary documents as given in the notification. Pay the necessary application fee and attach the slip with the application form. 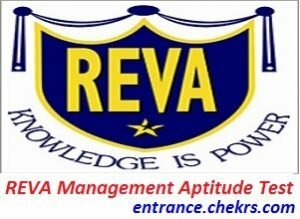 Aspirants will be select for admission by performance in REVA University Management Aptitude Test (REVAU MET). REVA MET Selection Process 2017 will be the performance in REVA MET/ CMAT/ CAT entrance test. Aspirants will be select as per Performance in group discussion and personal interview. Students can download their REVA MET Hall Tickets 2017 from the official website. Aspirants who applied for entrance exam can get their admit card. In the REVA MET Admit Card 2017 mentioned student’s details like name, roll no, exam date and another required information. Students required to bring admit card at appearing in entrance exam time. Without admit card students cannot get attend or appear to entrance exam. Students who have applied for entrance exam their REVA MET Result announces by REVA University. Students can check their REVA MET Result 2017 from the official website. Students can see the result by mention details like name, roll no, and date of birth. REVA University every year conducts entrance exam to get new session postgraduate students and provides the REVA MET Exam Pattern to students for making good and the high score in the exam. REVA MET Exam Pattern 2017 helps to students. In the entrance exam all questions will be objective type of multiple choice then students need to choose nay one options for the right answer. REVA MET Exam Center is a venue where students appear to entrance exam. The exam center of REVA University is all across in India. Aspirants can easily select any one exam center to attend entrance exam. Students to attend entrance exam need to bring ID proof and Admit Card on exam time. REVA University offered courses in management education and provides degree certification. Courses Offered by REVA University in various types of management course applicants needs to choose one course program to get the education in Master of Business Administration (MBA). For more information, students can click REVA University Management Aptitude Test (REVA MET) 2017 and get more and complete details.